Have you got a last-minute Steampunk wardrobe crisis on your hands? Did you try to make a Victorian outfit and run out of time? Maybe you just need a few more accesories to complete your look. Whatever your reason, the internet – with a little help from The Costume Rag – is your saviour. 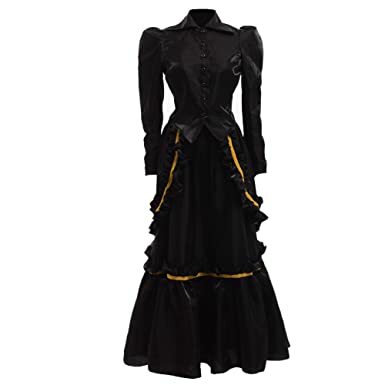 Here are some great Victorian and Steampunk costumes you can buy quickly and cheaply right now on Amazon. Some of the links may not work in your country or may redirect you to a similar item. If you still can’t find what you want click here to view more results for your location. Of course these are not going to be the best quality pieces available so if you have time you may want to think about how you can upgrade a basic polyester base. See our guides on the secrets to making a costume look authentic or breaking down costumes for maximum effect. If you need some great steampunk accessories then have a look at our Steampunk wishlist. 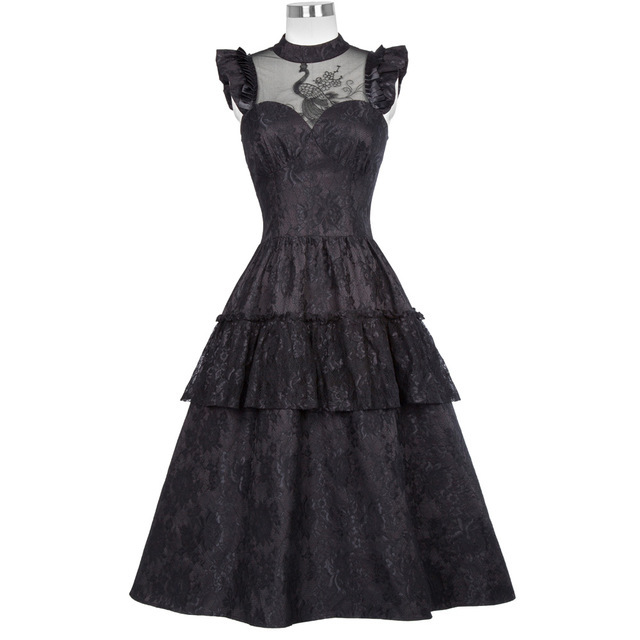 This cheap polyester victorian dress comes in three parts with bodice, skirt and bustle. This gorgeous victorian fashion dress is made of 100% cotton complemented with silky smooth satin fabric for the centre front panel. 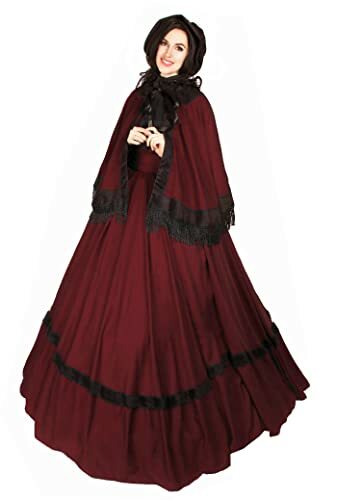 An elegant peacock design entombed in the front mesh, frilled sleeves, open corset back and just below the knee skirt make this perfect for a picnic in the woods or whatever other vampy Victorian engagement you may have. This steampunk style striped high low skirt has a banded high waist with an ankle length back tail with 3 tiers of ruffles. The ruffles are trimmed, special layers cover the whole skirt is very charming. Slightly gathered and adjustable length in front and raised at side by draw cord coming down from the waist,elastic waist design for comfortable wearing.This skirt has Eight functional buttons in the front. Perfect goth wear for festivals or every day! 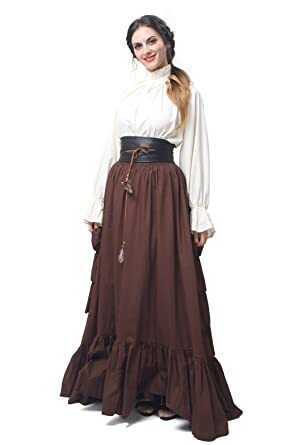 Made in a polycotton with ruffled stand collar and smocked waist, this steampunk costume has an overskirt with an adjustable waistband and delicate tiered skirt panels. 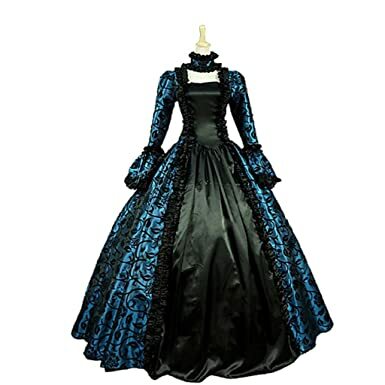 It’s perfect as a masquerade, cosplay or Renaissance Faire costume. Made from an excellent quality cotton blend, the dress includes the skirt, the cape and the sash although the Garibaldi blouse is not included and sold separately. The fabric is a lightweight polycotton blend of 85% polyester and 15% cotton. 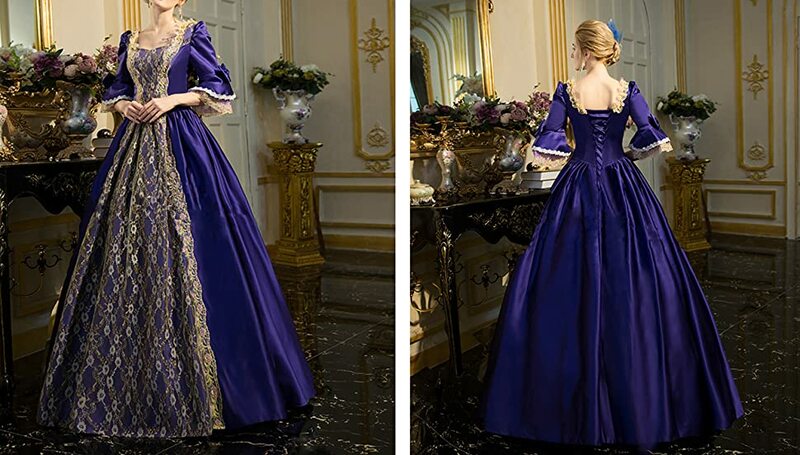 This elegant gown is made of soft polyester fiber decorated with lace hem. The bandage back design helps you to adjust your bust and waist easily, although you need to purchase the petticoat separately . The seller also recommends that it is better to purchase a hooped skirt. The dress is perferect for Halloween, masquerades , pageants and cosplay.